At Toni Harp's campaign office, volunteers worked the phones on Monday and gathered information to gear up for the big Election Day on Tuesday. They’re optimistic that Harp will soon be New Haven's next mayor. “We hope that we're going to win decidedly, and we're working really hard, we've left no stone unturned. As you can see in the office, we've got people in here who are going to be drivers, going to be [at the polls], we're going to be going door to door, knocking on doors,” said Harp, the Democratic candidate for mayor. Volunteers at Justin Elicker's campaign office were doing the same and getting together to make that last push to get people out to the polls. 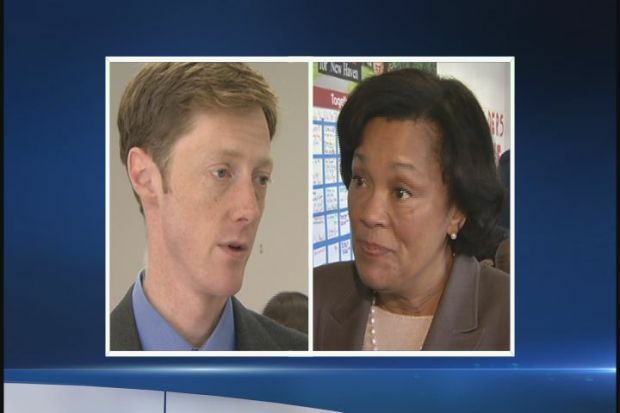 Toni Harp and Justin Elicker are asking voters to head to the polls Tuesday. They're hoping to see Elicker, the Independent candidate, take the lead at the polls and predict it will be a close race. “What's critical now, because there's about 18,000 unaffiliated voters that have not voted in the primary, it's critical that we get those folks to the polls. If my campaign is able to inspire those folks to come out and vote, we can win,” said Elicker. Both campaigns said they plan to work the streets and phones today for some last-minute votes. Speaking with voters, there are supporters on both sides. “I have talked to some people who are really going to, they think Elicker is going to make the difference,” said New Haven resident Anne Fielstra. “We got Ms. Harp for Mayor of New Haven, hope she do a good job of that,” said Mildred Mouzon. Whoever the winner is, he or she will be taking over for a mayor who's held the seat for 20 years. “I'm looking forward to voting tomorrow, and I think that's the extent of my political involvement, and I'm OK with that,” incumbent Mayor John DeStefano said.